The “Punjabification" of Hindi cinema moves a notch further west with Speedy Singhs (released internationally as Breakaway), a film about a bunch of Canadian Sikh men that uses sport as a plank for storytelling. The Indianness of this movie is probably restricted to the origins of the film’s characters and Akshay Kumar’s involvement. Kumar falls back on his lucky “Singh" title, but dons a new role as an executive producer and with a cameo playing himself, apart from hip hopping with Ludacris. 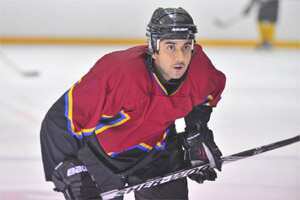 When Rajveer Singh (Vinay Virmani), a passionate ice-hockey player, fails to get into a local Canadian team, he decides to form his own team with a bunch of local field hockey players who can also skate. They call themselves Speedy Singhs. An amused rink manager, Dan Winters (Rob Lowe), in suburban Toronto becomes the team coach rather easily in order to help these men participate in the local championships. In between, Rajveer has to battle his father (Anupam Kher), who is vehemently opposed to his son playing “a Canadian" sport and intent on getting him into the family trucking business. Rajveer also woos the coach’s pretty sister Melissa (Camilla Belle) in between practice and parent duty. In many ways, this is Bend It Like Beckham meets Patiala House meets any other sports film where the underdog emerges triumphant against all odds. Filled with stereotypes, a predictable plot line and ordinary production values, director Robert Lieberman’s Speedy Singhs remains comfortably short of being memorable. Problems are resolved easily and quickly, people change their minds swiftly and the team goes from being ordinary to champions rather effortlessly. The sport scenes are not stylish but shot in a way that you don’t feel like you can’t understand what’s going on. But there are quirky little elements that make Speedy Singhs an easily watchable film. Most of the actors who play the hockey players are rather competent. Virmani, who also shares writing credits, has a pleasant screen presence, while Lowe is a charming addition. Comedian Russell Peters as Rajveer’s to-be brother-in-law has his moments with some clever lines, while Al Mukadam as Inderjit, the goalkeeper, is superb. The music is foot-tapping, with a smartly shot end credit. Speedy Singhs does not take itself too seriously, which is its biggest asset. Also, at 1 hour, 30 minutes, it’s not too much of a strain on your time. Speedy Singhs released in theatres on Friday.